The suspects allegedly robbed a Verizon Store on Yale St. before the chase started. HOUSTON — Two robbery suspects have been arrested after leading police on a 15 minute chase in east Houston Monday. Police released the mugshots of the suspects Teddrick Sanford and Clayton Lamont Jenkins on Wednesday. Officers are still looking for a third suspect. 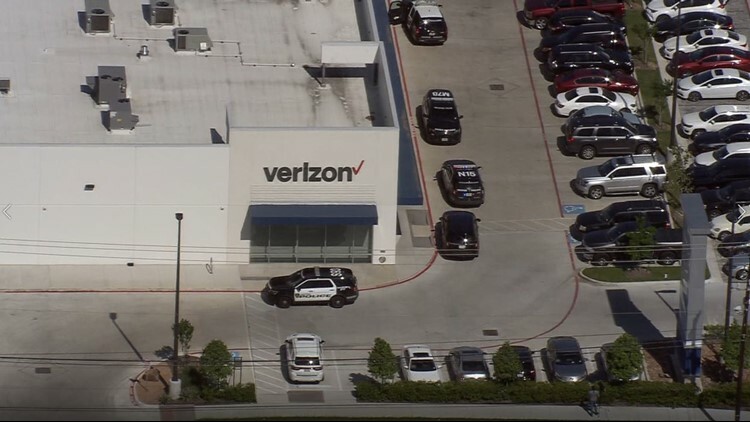 The robbery happened at a Verizon store in the 3000 block of Yale St.
During a press conference, Assistant Chief Troy Finner said an off-duty Houston police officer, who has been on the force for 7 years, was working security at the store when two of the suspects rushed in, stole her gun, held her and the employees at gunpoint and then stole several cellphones. The suspects left the store and got into a black getaway vehicle. Officers in the area spotted the car and tried to get them to stop, but the suspects drove off and a chase began. One of the suspects jumped out of the car on E. 38th St. near 610 but was quickly arrested, Houston police said. The second suspect jumped out of the car minutes later. Police are still looking for him. The third suspect, the driver, kept going. He crashed into a car parked on the side of the street before he stopped his car near Lyons Ave. and Waco St. He jumped out and ran away, but police in the area stopped him in his tracks and quickly detained him. “You come out in or city and do crime, we gone get you,” Chief Troy Finner said. The off-duty officer’s gun was recovered and the cellphones that were stolen. Chief Finner said he is pretty confident officers will find the third suspect.